Increasingly, cars are fitted with puncture repair kits rather than a spare tyre. They’re easy to use and quicker than replacing a wheel. 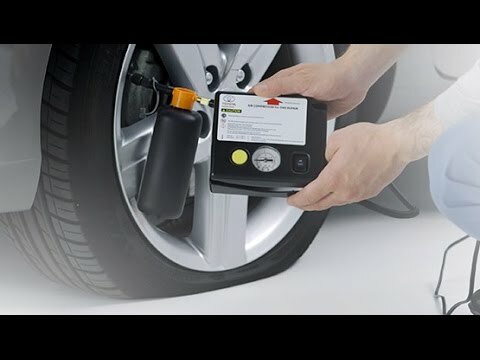 Watch our video to understand how to use your Toyota tyre repair kit. If you think you have a puncture, do not continue to drive your vehicle; this can rapidly cause further damage to the tyre and wheel. Since 2012, every Toyota passenger vehicle produced for the UK market has been equipped with a tyre pressure monitoring system; if the warning symbol lights up, the air pressure in at least one of your tyres has dropped below a minimum tolerance level, often signalling puncture. A juddering steering wheel is another tell-tale sign that you may have a punctured tyre. Stop your car in a safe place. If needed, set up a warning triangle and turn on your hazard lights. Apply the parking break to ensure that the car remains stationary. You suspect that the tyre has been flat or at low pressure for an extended period. If you notice a nail or screw lodged in your tyre, leave it. Removing a nail or screw can increase the size of an air leak, causing your repair kit to fail. Move your car so that the puncture is located at the top of the tyre. Secondly, make sure that the air valve is positioned in the top half of the tyre; this will help to stabilise the bottle of sealant you’ll use to fill the hole. Your Toyota repair kit can be found in the boot of your car; lift the false floor and take out your kit. The kit should contain a compressor for reinflating the tyre, a bottle of sealant and warning stickers. Apply a sticker to the wheel to show that the tyre has sealant in it, and a second sticker to the A pillar, reminding you to change the wheel at the next opportunity. Remove the valve cap and screw the sealant bottle tightly on the valve, then remove the cap from the end of the sealant bottle.